This paper focuses on the safety assurance measures within the International Electrotechnical Commission’s international standard IEC 61508, ‘Functional safety of electrical, electronic and programmable electronic safety-related systems’. IEC 61508, and other sector and product standards developed from it, have had a major impact on the application of electrical, electronic and programmable electronic safety-related systems. In particular, the paper examines the safety assurance measures that are part of the compliance requirements within IEC 61508. 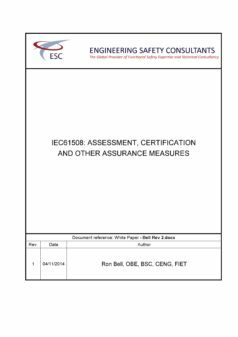 The paper provides an overview of the key features of IEC 61508 which are relevant to effective assurance as well as covering the explicit assurance measures such as functional safety assessment, functional safety audit, verification and validation. The paper also covers various models for certification that have developed in relation to IEC 61508.